There are dozens of homeless rabbits throughout California awaiting permanent homes. 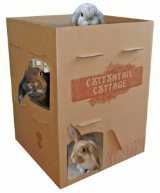 Before buying from a breeder, swap meet, or pet store, please consider adopting from your local shelter or humane society, or from a rabbit rescue organization. Many rabbits are euthanized at shelters annually! By adopting a rescued/ homeless rabbit, you truly are saving a life. In fact, you may be saving many lives because rabbits adopted from shelters, humane societies, and rescue organizations usually are spayed and neutered already, so they cannot create more homeless bunnies.